Dutch Thrashers Disquiet are set to release their second full length album The Condemnation early in 2016, and this is a monster, it’s on the Blackend end of the Thrash spectrum but also incorporates plenty of melodic parts in the guitars and some overall class. The production is crisp and clear and the overall sound is excellent for the ten tracks on offer. There is definitely a hint of Kreator and Testament here and there, but also some heavier elements pushing some tracks towards the Melodic Death spectrum (think At The Gates or ‘Heartwork’ era Carcass). Having not heard 2012’s Scars Of Undying Grief I wasn’t sure what to expect when I first listened to the band, as Thrash music is a much broader spectrum again these days, and thankfully here we have a band stretching the boundaries a bit. Everything here is written and put together really well and it’s just that little extra crunch in the riffs that gets your head bobbing from the first listen. It may not be creating a new form, but at the same time there is a freshness and a modern feeling to the music, it’s sharper and better sounding than most things out there at the moment, Disquiet are offering fast, heavy aggressive music up to you on a plate. The title track “The Condemnation” stands out as one of the best on the album, the riffs are just so damn chunky and addictive, and everything just fits in place perfectly, vocals are aggressive and barked at you, but there’s enough melody in the music to hook you right in. Along with “The Great Divide” which is a brilliant track is very powerful and full of all our aggression, lyrically it is based on a Wilfred Owen poem ‘Dulce et decorem est’ about the ideal sold to young WW1 soldiers that it was a great honour to fight and die for your country, once the track gets into full stride it’s pummeling. Finally “Haul Down The Tree Of Life” offers something on a different variety, still heavy, but vocally delivered at a slower pace and there’s just a different depth to this one, and it follows the general theme lyrically of selfishness and greed within society, and people’s desire for wealth and power above all else. 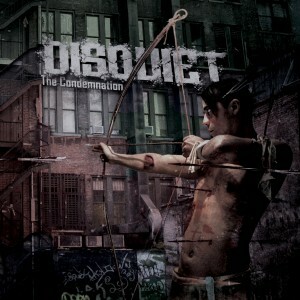 What a cracking way to start the New Year, a quality Thrash album pushes and screams from start to finish, this album is going to be kept in rotation on my music players for a long time, Disquiet will make their way to the UK at the end of February/start of March and it would be brilliant to get to hear some of these tracks live, I’m sure they will be ripping the venues they hit apart. Do yourself a favour and get this album blasting into your ears. Cool way to start the year 2016. Hell yeah!!!! Love it.